Maggie the German Shepherd and Lila mix-breed, who are usually separated into the big and medium sides respectively, became fast friends today. Maggie has always been great with all kinds of dog, be they smaller, bigger, older, or younger. Lila is similarly friendly, so it isn't surprising that they fell in together so well. Check out a clip of them playing! I love looking for dog-related articles, so here's one to share from today's hunt. It's a bit of old news, but I had certainly heard nothing about it. We all know that the ancient Egyptians honored their pets with elaborate burial chambers and mummification rites- did you know that the inhabitants of ancient Peru did something similar? They had a separate burial ground for pets; each with its own grave, and some buried with blankets and food. Thanks for checking out today's blog! 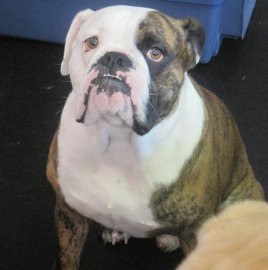 Fort Fido has had all kinds of rescue dogs attend daycare. It feels great to see a rescue dog having a blast here! This morning's assessment is a neat example. Walter was rescued from the streets of Taiwan! Let's just say his first six months of life were pretty rough... Now he has a wonderful setup that includes a kind and loving family. 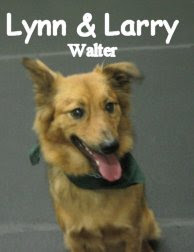 Walter is a spunky Shetland Sheepdog / German Shepherd mix, he is 14 months and about 25 pounds. This guy thought he had died and gone to heaven lol, Walter went non-stop in the Medium Roll, I hope he is tired! He played nicely with the others, we look forward to seeing more of him. Bomb sniffing dog awarded medal, It's amazing what these canines can be trained to do. Blind sled dog, I think the dogs love it and I love the great race! Dog's howling at the "Law and Order" theme song, maybe it hurts their ears lol? A great service dog story, absolutely wonderful, we need more of this. Not too long ago (Here) I mentioned "The Oasis Of My Soul" blog that I enjoy. Another great picture (there are many) of Ara's dog Spirit popped up so I thought I'd share it. 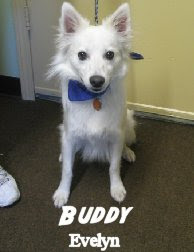 He is hanging out with his buddy Opal (an American Eskimo). They have some super cool riding gear haha! P.S. Opal looks a heck of a lot like our pal Buddy! A little clip of Bella (Boxer), Benny (Golden Retriever) and Jake's (German Shepherd) shenanigans in the Big Roll this morning. Elvis has left the building... His assessment went smoothly this morning at Fort Fido (He's been to daycare before and is all about it). 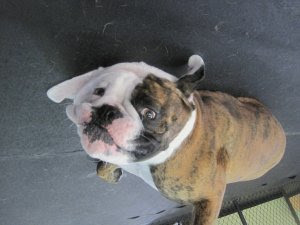 He had a fun time whirling and wagging with almost everyone up in the Little Roll. 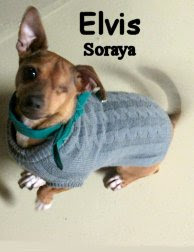 Elvis is a three year old, 12 pound, Chihuahua Mix that has one eye! 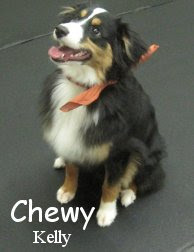 His owner named him Elvis because he does that classic "curled lip" face that Elvis the musician often made, too funny! What a neat dog, hope to see him again soon. We all know that dogs can sometimes do incredibly heroic things. Here is a story about Blue the Queensland Heeler, who stoically tended a lost child through a cold desert night in Arizona. Here's a story about a Florida Schnauzer named Toby who pulled his owners to a very sick cat, whom they brought to Safe Harbor Animal Sanctuary and Hospital for treatment. One last story, this time about a Pomeranian who alerted the household after his owner suffered a violent epileptic seizure. Gangsta, the Pomeranian, barked and yipped until his owners sister came to check on her. If you're interested in more stories of canine heroes, go to Google.com and search "dog saves life." Pages and pages of stories will come up for you to check out. 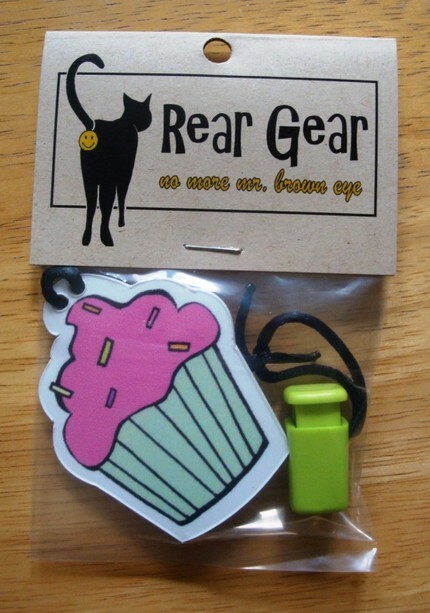 Now here are those clips I promised you! Next we have Chloe's personal statement about coming to Fort Fido! I don't think that girl ever stops wagging her tail. Have another great weekend, and enjoy this lovely weather! I was chatting with Rainier's Mom yesterday about Frisbee dogs. I enjoy watching them, it beats the heck out of stuffy old dog shows haha. This clip (from Japan) is an amazing example of the freestyle portion of Disc Dog competition. Talk about patience and practice, getting our canine buddies to mind can be hard enough lol! The assessment this morning was a double header, Lilly and Trixie! 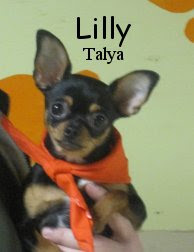 Lilly and Trixie are sisters, they are 10 month old, Black & Tan (with white chests) Chihuahuas. I'd describe these little gals as elegant and good-natured. The easiest way to tell them apart is by their size. Lilly is 5.8 pounds while Trixie is 7 pounds. That has been helpful because they are practically twins! Lilly and Trixie took to the Small Dog Roll smoothly, they were excited, enganging in little "chase games". Neat dogs, totally welcome here at Fort Fido. P.S. A few articles that may be of interest... Charles Dicken's dog collar sells at auction, a lucky pup is rescued from a storm drain and Sadie wins the Westminster Kennel Club Dog Show (o the politics lol, she just won the AKC best of show in December... Thousands of dogs, how can this be? Hahaha, sorry, it's all just strange to me). 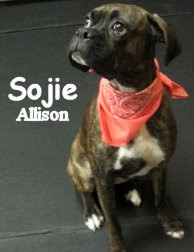 Sojie is a 14 month old, 53 pound, brindle Boxer who had her assessment this morning. She is very sweet and started out in the Big Roll with another Boxer her size (Miss Bella). Although Sojie didn't play, she seemed to be interested, right on the brink of "Busting Out". We here at the fort are almost certain that she will be letting loose soon. Welcome Sojie! Congratulations to Louis! He passed his Canine Good Citizen test last week. 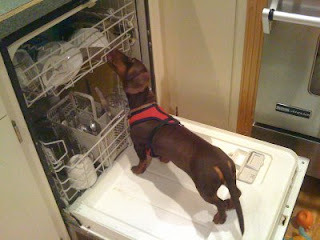 The test is not easy either, it takes hard work and dedication by owner and dog to pass. Way to go you guys! This morning's assessment was Grizzly Bear. 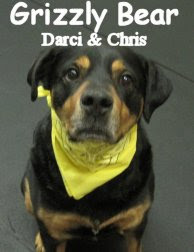 He is an eight year old, 120 pound, Rottweiler mix. "Grizz", being the big and lovable guy that he is, greeted his new young pack well. Like an Old Timer, he frolicked for a bit then sat back and enjoyed the show. Grizz seemed to be happy and content here at the fort, in the Big Roll. We hope to see more of him soon. P.S. Lila's Mom Darcy told me about Dogtown this morning... You've probably heard about it, it's on the National Geographic channel (Michael Vick's dogs were rescued through this organization). What a wonderful group doing wondrous things! Who would have thought that dogs would soon be breaking into the Twitter phenomena! Mattel announced the impending release of a gadget called "Puppy Tweets," which owners can put on their dog's collar and will transmit messages to Twitter (called "Tweets") automatically. Puppy Tweets captures the dog’s level of activity and barking and translates that to a humorous or poignant tweet that’s sure to make the owner smile. In other news, three new breeds of dog have been officially recognized by the AKC and will be competing in the Westminster dog show. The Norwegian buhund, Irish red-and-white setter, and the Pyrenean shepherd have all been welcomed into the elite ranks of show dogs. Over the past 25 years the AKC has recognized 25 new breeds, and there is a list of about 60 other breeds that are lobbying for recognition. The Westminster dog show looks to be getting more and more interesting as even more breeds are recognized in the years to come. Check out a clip from the Fort: check out the action in this video! Annie, who is usually with the medium-sized dogs, certainly made the most of her romp with the big dogs today! Annie is a mixed breed, with some Boston Terrier and Retriever in her. Walter and Max are both Standard Poodles. Walter is a little smaller, darker, and fluffier than his buddy Max. Just a clip of Jake & Lila having a good 'ol time in the Medium Roll today! In other news, I was surprised to find this article on MSN's homepage the other day. I don't want to alarm anyone but it is interesting... We've heard many odd stories regarding veterinary care. Please just be cautious and don't get taken on a ride ($$$) just because it tugs at the heart strings. If a vet clinic encourages you to put your dog on a "special food" or "prescription diet" be wary, educate yourself first (it's all about money and "The Man" man lol). Kumpi may not be the cure all solution for pet food but it's NEVER had a recall and every batch goes through extensive testing for pathogens, freshness and quality of ingredients (to not ever have a recall). It's made in the USA and there are no ingredients from China. The money is spent on the food, not on fancy marketing. In short, just because your dog's food is from The Vet doesn't necessarily mean it's right or healthy (Cough! Hills Science Diet. Cough!). Mr. Miles Davis Baker had his assessment this morning. What a wild 'n woolly ball of cute this chap is. 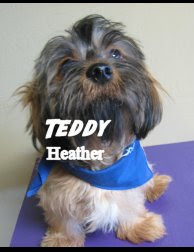 He is the fort's second Shorkie (Benson introduced us to the lovable mix). 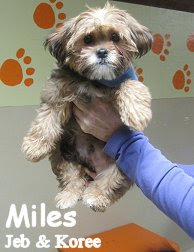 Miles is only 15 weeks old and about five pounds. He had a fantastic time upstairs in the Little Roll. It took him a bit to warm up but once he did, the good times never ended. I think Miles was in Heaven up there haha. We will be seeing more of him soon. Here is a short clip of Miles right when he started to play... You can hear that Mom (Nancy) is very enthusiastic, happy that he finally "Busted Out". Right on! P.S. This is the funniest thing I've seen all week... And the following YouTube clip is wildly awesome and amazing lol. Nothing fancy today, just three articles I thought you might enjoy. More news about "Baltic" here. A sad, heartwarming and amusing story about a kid named Bronson and his dog Buck is right here... Poor fellas! Last but not least is this article, I can hardly believe it hahaha! 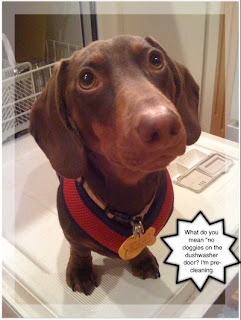 Coco's owner Marie sent us some cute and funny photos of Coco yesterday. I thought I'd post them up here for all to see. Coco has a lot of fun here at the fort. 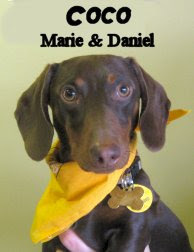 He is a chocolate Miniature Dachshund, about 12 pounds and almost two years old. We got a clip of our trainer Garrett Stevens in action. It was taken during our last group training class. Garrett is awesome, very lively, result oriented and hands on. 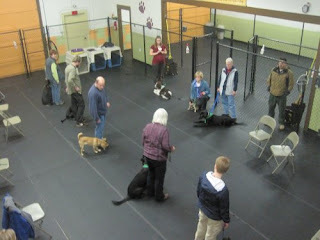 The class was working on "heeling" at the time. Click here to checkout upcoming classes and seminars at the fort with Garrett. If the traditional Super Bowl is not your thing, you can check out Animal Planet's sixth Annual Puppy Bowl-- airing at the same time as the sporting event. The Puppy Bowl also features a half-time show, made up entirely of kittens. 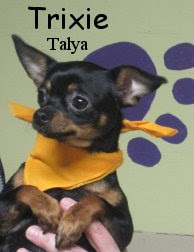 All featured animals are available for adoption from various SPCA shelters around the country. Click here for a clip of this year's Starting Lineup! Have a great time, whatever your weekend plans may be! PS-- Here's a clip from the action today! Maggie the German Shepherd leads around Louis the Olde English Duldogge, Sarah the Black Lab and Kyoshi the Akita. That's one popular ball! This morning's assessment was Ryker. He is an eight month old, 80 pound, Yellow Labrador Retriever. Talk about energy and excitement! When he came through the door I think he knew what was going on, "Yes, It's time to play Doggie!". Ryker played (or at least tried to play) with almost everyone in the Big Roll. He made quite a few buddies and really ripped it up, in short, he was into it! 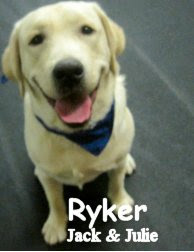 We plan on seeing more of Ryker, Doggie Daycare is really good for this one. P.S. 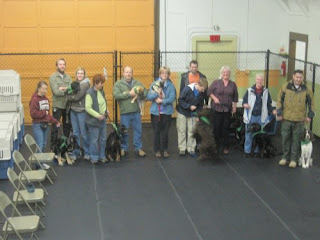 Another Basic Obedience and Leadership class (with trainer Garrett Stevens) graduated last night, here are a couple of photos. Also added a clip of Ryker and Finn! 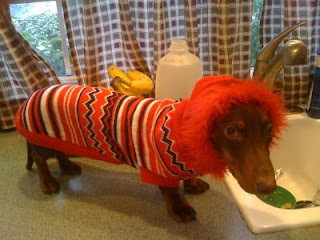 Hey there, just going to direct the interested towards a few articles today (ya gotta keep up on your "doggie news")! The first article, found here, is about another lucky dog. Holly Cow! Talk about "rescue dog" lol. The second article, right here, can cause a debate... I'm somewhere in the middle. Feel free to ask me about it haha. Last but not least, the third article here, has even more information about that daring rescue in LA. Bella the Great Dane had her assessment this morning. She is a adorable, sweet and spunky gal. 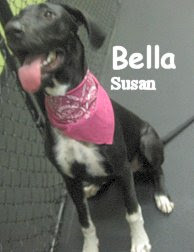 Bella is six and a half months old and already 86 pounds! She is going to be one big girl! Her first steps into the Big Roll went smooth... Here she is taking on Ruger and Dakota. Too fun! P.S. Remember this amazing rescue I mentioned last week... Here is a little follow up, interesting. Kona is a darling little Australian Labradoodle that embarked (Embarked... Get it? Hahaha) on her first Fort Fido session earlier today. She is six months old and about 20 pounds. We started her in the Medium Roll, after a bit of hesitation she took off and had some fun. Good job Kona! We hope to see you playing even more soon. Here is a clip of Kona just starting to find her groove with Cooper, another Australian Labradoodle, birds of a feather I suppose! That's black Candy the Cockapoo... She can play ball by herself lol! Miller and Seamus can also be spotted. This one is of Ruby and Buddy (an English Springer Spaniel) becoming the best of friends (new pup Jake can be seen lying on the floor).